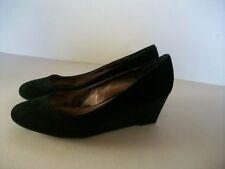 GABOR Black Suede Wedge Court Shoes Size 5. Condition is Used. Worn twice only so in excellent condition. No marks. Dispatched with Royal Mail 2nd Class. Gabor Purple Suede Shoes 6.5. Dispatched with Royal Mail 2nd Class. Original price £89.99. Buckle effects heel. Wood effect heel. See pic with defect at heel. Still got lots of wear. 3 inch heel. Fab shoes in excellent condition. Ladies shoes size 6.5 Gabor. Lilac colour. Very good condition. Can be used for work or social functions, grab yourself a cheap pair of quality shoes for the new year. Condition is New with box. Model: Becca. Material: Patent Leather (upper), Synthetic(sole). Ladies Gabor Lilac Leather shoes size 6.5/40 eur. Like new but tried on/worn indoors. Gabor Sport. LADIES LOAFERS / DRIVING SHOES. Blue suede leather uppers. UK 6.5 - EU 40. Quality comfortable shoes. 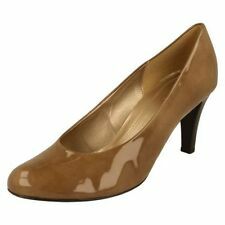 These brown leather slingback heeled shoes by Gabor are perfect for many occasions. They are great for the spring weather! Treat yourself! Heel; 2.5". These black heeled shoes by GABOR are ideal for parties, the office or both! Treat yourself! Of outfits.Navy matte suede UK 3.5. I bought them for part of my ‘going away’ outfit. They have striped detail on the heals. 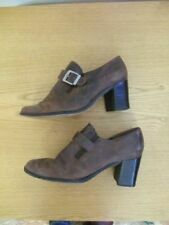 Gabor sling back shoes size UK 7 EU 40 US 9. Perfect for occasion, party wear. These have been worn once, excellent condition all wear shown in the pictures. Upper: Suede leather. It also features a soft leather lining and footbed and construction for comfort and flexibility. Lining: Leather. Footbed: Leather. Ladies Gabor shoes. in very good condition. A pair of Charles Clinkard ladies Gabor white leather Ruffle shoes in size 5 1/2. They cost £79 and are in excellent condition having only been worn once and in original box. Gabor Sandals Soft Leather slingback Shoes with low platform heels. Nubuck Leather Top, Rubber Sole. Style: Slingback peephole. Colour: Lilac (Pale violet). Size: UK 6.5, US 8.5, EU 40 D. 100% Genuine Original Designer Item. Gabor navy blue heeled shoes in a size UK 5. These have only been worn once or twice and are in lovely condition. The Gabor shoes are sleek and feminine Mary Jane style shoes with bountiful outfit pairing potential.Whether worn to the office or out to dinner, these shoes are sure to add a special edge to any outfit. Gabor Patent Toe Stretch Top Court Low Heel Shoes UK size 8. Hardly worn, slight marks to patent as indicated in last photo, not cery noticeable though. A smart brown suede court shoe with a rounded toe and layer flower head design to the side. They have a low 1.5in block style heel. Gabor blue patent wedge heel sling backs. These are a UK 4, and in good condition. They have a few light marks on the patent where the shoes have rubbed together during wear, but nothing significant. Lady's Gabor black leather shoes size 6 1/2 # soft leather lining and cushioned inner sole for extra comfort wear # strap cross over with a fixed leather button on the outside and an elasticated strap to the side of the sole for easy slip on new with original box in good condition. Size 6 deep chocolate brown court shoes from Gabor. A very smart brown textile shoe with a squared off toe and slim heel. The heel is very stylish and narrows as it goes up the heel. See pictures. A pair of ladies Gabor Court Shoes • Size 5.5 • Bow Detail with tiny little studs • 2” Heel • rounded front. • Good condition with minor marks here and there. One slightly more noticeable one on back of right shoe. Gabor black leather court shoes. lining is also leather. Mother bought them in Germany hence inside the shoe is states that the outter of the shoe and the lining is real leather in german. New without box. Ladies Gabor Fitting Leather Court Shoes Black Smart / Office Wear Comfortable Size 5 / 38 Water / Scratch Protected This item is in its original box and is in new condition, showing no signs of wear: it would be the same condition you would see from a shop. Great everyday shoes to match with anything particularly office wear. Will look pretty with jeans too if you want to go for a smart casual look. Quality from Gabor. Lovely ladies shoes. Manufacturers size - UK 6. The uppers and lining are made from leather and soles are synthetic. Perfect for special occasions, work wear or casual wear - very versatile. 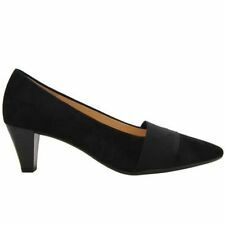 Gabor Women’s Black Leather Shoes. Used . Condition is Used. Dispatched with Royal Mail 2nd Class. Ladies Gabor Black Heels. Perfect for work or Smart Occasion. Size - UK 3 EU 36.